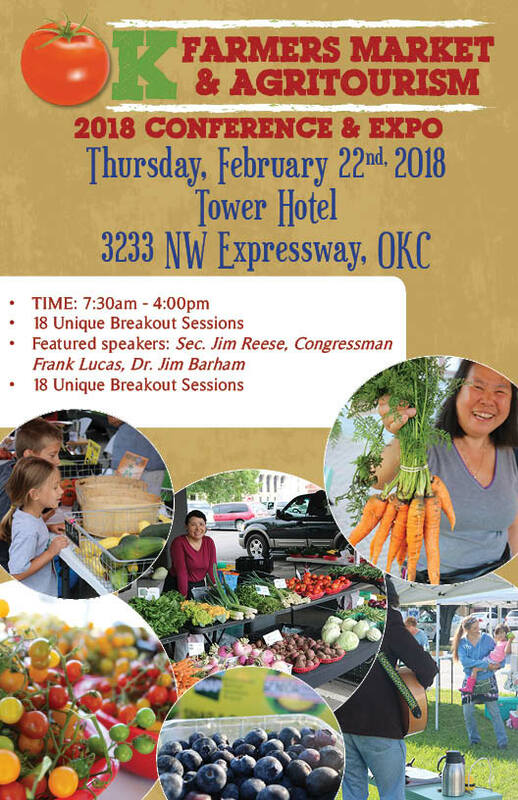 I had the pleasure of attending the 4th annual Oklahoma Farmer’s Market & Agritourism Conference. Even though we had some rain and ice the day before the conference and that night there was still a good turnout. The conference is funded by the U.S. Department of Agriculture, Agricultural Marketing Service’s Specialty Crop Block Grant Program through the Oklahoma Department of Agriculture, Food, and Forestry; the Oklahoma Nutrition Information and Education Project through the Oklahoma Department of Human Services and the U.S. Department of Agriculture; the Oklahoma Agritourism Association; and the Oklahoma Tobacco Settlement Endowment Trust. Some of the sessions that you could attend at this year’s conference was being able to accept SNAP benefits at markets, farm Agritourism, season extension with hoop houses, aquaponic gardening, soil management, irrigation, and many more. Being able to attend this conference is a great benefit to a producer in many aspects. One is to learn new up and coming gardening techniques and to network with others in the farming community. I had a wonderful time talking to other Farmers Market Managers and Board members as well as individuals that work at ONIE. Other than attending this great conference I was asked to speak about Aquaponics. Kaben Smallwood from Symbiotic Aquaponicand I took turns speaking about the different types of aquaponic systems and how we use our aquaponic systems to boost our farms. I had a great time speaking and sharing with other farmers how we use our aquaponic system to raise bedding plants and large quantities of lettuce, herbs, and kale. The Choctaw Nation of Oklahoma Tribal Extension Agent Agriculture Outreach was also represented there, not only by Kaben Smallwood and myself but several individuals that work for the nation was there in attendance. They also made it possible for me to stay at the hotel where the conference was being held. The Choctaw tribe helped pay for the rooms of some of us that attended the conference helping us keep the cost of such a trip down to a minimum. I thank them for making that possible for some of us, it was a great benefit and helped make attending possible. Thank You for those that made this happen. The Pittsburg County Health Department was there also. Connecting with your local health department and TSET personnel helps farmers to become better at food safety and the markets to be food safe. The Pittsburg County Farmer’s Market have been working close with the TSET personnel the past few months on how to improve our market. Food safety are not the only resources they have help provide us with. I appreciate their assistance. Overall the conference was a remarkable success and I really enjoyed attending this year. The people you meet and the networking available there was awesome.